"My art suggests and comments on situations but does not resolve them." Los Angeles, CA (February 27, 2019)—Opening at the Autry Museum of the American West on March 31, 2019, the exhibition Indian Country: The Art of David Bradley explores the artist's four-decade career and his deeply thoughtful body of work, a combination of personal experience, social observation, and the influence of art historical icons from Leonardo da Vinci to René Magritte and Andy Warhol. Influenced by the Pop movement as well as the stylized, pictorial narratives of traditional Indian painting, David Bradley's oeuvre occupies a space in between Native modernism and American pop, and has an immediate, visceral impact. Bradley (b.1954, Chippewa) is best known for his keenly observant and witty narratives, which depict the Native experience of tourist and commercial culture in rich detail and bold, saturated colors. 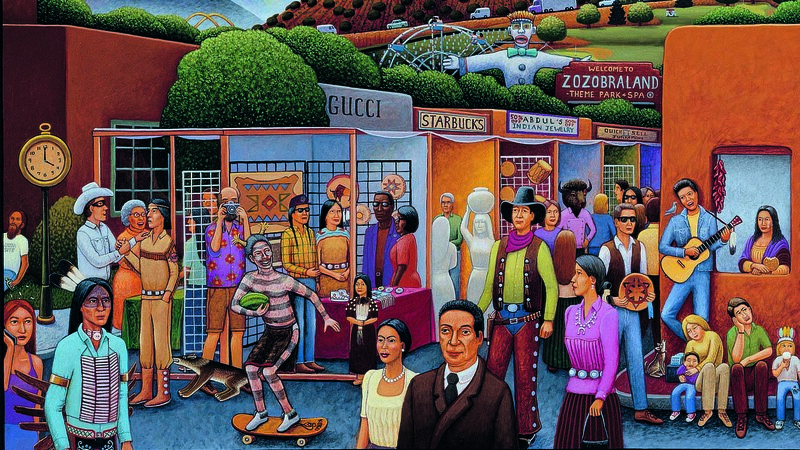 Populated by a wide range of characters— from Tonto and the Lone Ranger to Bill and Hillary Clinton, Vincent Van Gogh, and Georgia O’Keeffe—Bradley’s work comments on and satirizes a wide range of themes from Hollywood clichés to Native stereotypes, the art market, and the racism imbedded within them. "Through absurd juxtapositions and his trademark humor, David Bradley reveals deep—and often painful—truths about the Native experience in the United States. Using his extensive knowledge of traditional Native American painting, European modern art, and the tourist culture in Santa Fe, Bradley rewrites longstanding narratives about art, popular representation, and the commodification of Native peoples in the Southwest," said Amy Scott, the Autry's Executive Vice President for Research and Interpretation and Marilyn B. and Calvin B. Gross Curator of Visual Arts. "Bradley's tone is often deceptively light, and his work fills viewers with a kind of joy, even as it implores them to digest the biting comments he makes about the world around him." Bradley was born into a low income household in Eureka, California to a Native mother and white father. The family moved to Minnesota, where he lived first with his mother and then in a series of foster homes until a non-Native family adopted him. Removed from his tribal heritage and culture and raised in white society, the artist experienced first-hand the racism toward Native people in Minnesota during the mid-twentieth century. Bradley struggled to reconcile Native and mainstream traditions, like so many others in his community, and this struggle is prevalent in much of his work. After leaving Minnesota, Bradley entered the Peace Corps in the mid-1970s. He then studied at the Institute of American Indian Art (IAIA) in Santa Fe, New Mexico. Santa Fe and its commercial art scene rankled Bradley, and both became fodder for some of his most celebrated paintings. In Santa Fe Trail, for example, recurring characters Tonto and the Lone Ranger appear in the foreground, while in the background "Santa Fe," depicted in the fashion of the Hollywood sign, suggests a commercialization of the New Mexico city. Ultimately, however, Bradley settled in Santa Fe, purchasing land that he named Chippewa Ranch after the White Earth Indian Reservation where his mother lived. He still lives there today. Indian Country: The Art of David Bradley is curated by Valerie Verzuh and includes 32 works of art, including painting, mixed media, and bronze sculpture. A fully illustrated publication accompanies the exhibition. This exhibition has been organized by the Museum of Indian Arts and Culture/Laboratory of Anthropology, Santa Fe, NM, and circulated through Guest Curator Traveling Exhibitions. Bradley has received numerous awards and fellowships, including recognition as the only artist to win the top awards in both the Fine Art categories of painting and sculpture at the Santa Fe Indian Market. He was also awarded the Southwestern Association of Indian Art Fellowship in 1980 and the Minnesota Chippewa Art Award for Merit in Art in 1979, among several others. He has exhibited his work throughout the nation, including the Plains Indian Museum in Wyoming, the Heard Museum in Phoenix, Plains Art Museum in Fargo, the New Mexico Museum of Art, and the Armory for the Arts in Santa Fe, the Southwest Museum in Los Angeles, the North Dakota Museum of Art in Grand Forks, the Smithsonian Institute in Washington DC, the Minneapolis Institute of Arts, the American Indian Art Invitational in Lima, Peru, and many others. His work is in the permanent collections of various museums throughout the United States. The Autry is a museum dedicated to exploring and sharing the stories, experiences, and perceptions of the diverse peoples of the American West, connecting the past to the present to inspire our shared future. The museum presents a wide range of exhibitions and public programs—including lectures, film, theatre, festivals, family events, and music—and performs scholarship, research, and educational outreach. The Autry’s collection of more than 500,000 pieces of art and artifacts includes the Southwest Museum of the American Indian Collection, one of the largest and most significant in the United States.